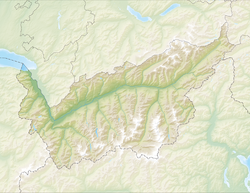 Martigny (German Martinach) is the caipital o the French-speakin destrict o Martigny in the canton o Valais in Swisserland. ↑ Annuaire-Mairie.fr. "Ville d'Aoste" (in French). Retrieved 2013-06-18. This page wis last eeditit on 8 Mairch 2018, at 05:33.